Q: What is anatomically narrow angles? If the angle closes, then fluid is made inside the eye, but it cannot drain out. Imagine what would happen if you kept inflating a basketball after it was already filled with air. Inside the eye, if the angle closes, then fluid will build up in the eye – causing increased eye pressure. If the pressure in the eye becomes too high, your eye will become very painful, and you may have permanent vision loss. No. Anatomically narrow angles can cause high pressure in the eye (often referred to as glaucoma) if the angle becomes closed. Anatomically narrow angles are a risk factor for glaucoma, but it does not mean that you have glaucoma now. 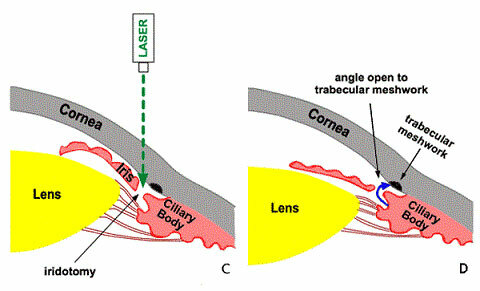 Q: What happens if I have anatomically narrow angles but I do not have the laser iridotomy? 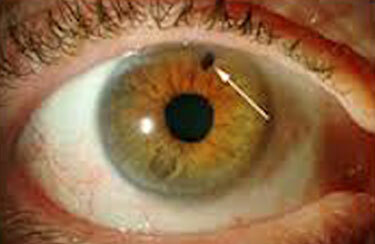 There is a small risk (1-2%/year) that you will develop angle closure, and severe eye pain and vision loss. Once angle closure develops, it is hard to treat. There is also the chance that the angle will close slowly and cause scarring, and slowly increase pressure in the eye. There is often no pain with chronic angle closure, and you can loose vision without being aware that your eye pressure is high. The laser iridotomy is performed in the laser room. You do not need to go to the operating room. You do not need any blood work or a medical exam prior to the procedure. You will be awake, but your eye will be numbed. The laser procedure is brief – it takes between 1-2 minutes for the entire procedure. There are no restrictions on your activities after the procedure. Your vision may be blurry for a few minutes after the procedure, but your vision should return shortly. There is also a risk of increased eye pressure, and we monitor your eye closely after the procedure. Q: What is the after care after YAG laser iridotomy? You will use steroid eye drops 6times /day for 5 days. You will see Dr Sagar Bhargava after 1 week when the angle structure will be rechecked and retinal examination will be done. Yttrium alumninium garnet. This is a synthetic gemstone used to create the specific wavelength of light for the laser procedure.